This is it. My first modular. Every year, the LEGO Creator Expert designers spoil us with a new modular. All of the modulars, originally released in 2007, have been designed with AFOLs in mind. They often incorporate intriguing build techniques, great colours, rare and often new parts, and a much more complex build style. There is so much in this set to talk about, and while I’ll try not to reveal everything, there will be spoilers, so if you don’t want to ruin the experience, stop reading now, as spoilers abound! I mentioned last week that this review will be split over 2 weeks. Due to the sheer size and amount of awesome included in this set, I’ll be talking about the minifigures, parts and build floor by floor. 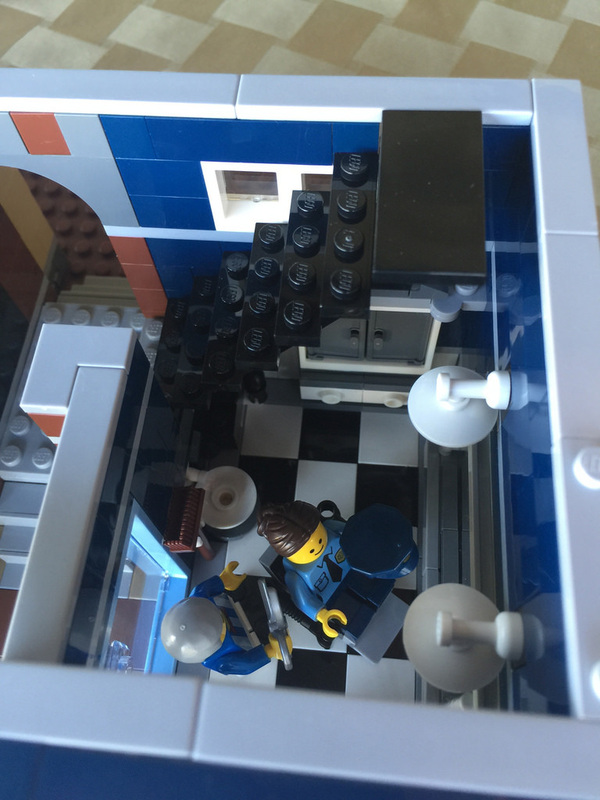 This week will be the ground floor and left half of the 1st floor (the actual detective’s office), with next week completing the building, a quick review of 40140: Flower Cart, and giving a rating. I’ll try to keep some things a mystery, but there will be plenty of photos, as modulars are always very photogenic sets! I’ve taken around 70 photos of this build alone, so I’ve uploaded all the images to this Flickr album. Anyway, on with the set. 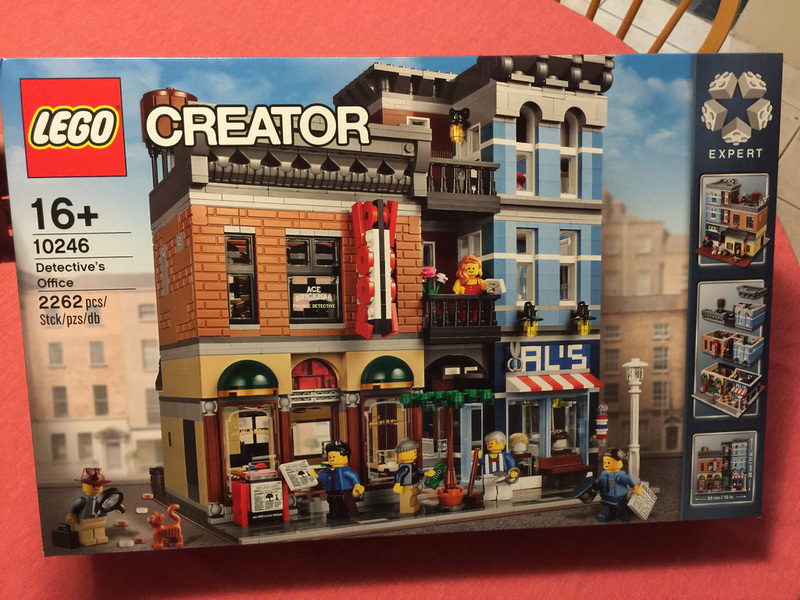 Now, the set is called Detective’s Office, but it has so much more. In fact, the actual office only takes up 1 of the 5 rooms in the building. 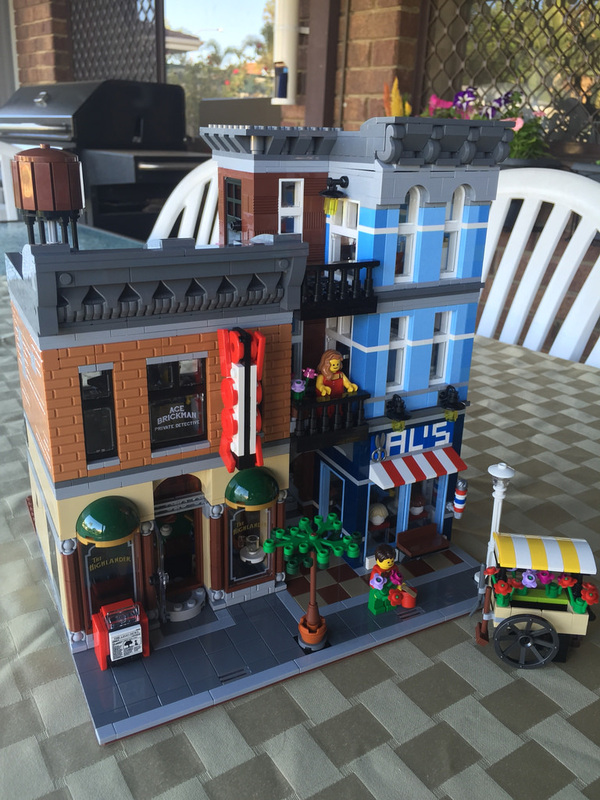 There is so much in this set, including a pool hall, barber shop, bathroom, kitchen, rooftop, and street. I had an absolute blast building it. There’s also a story for the set. It’s a kid-friendly version of Prohibition, where alcohol smuggling isn’t the problem, but cookie and sweets smuggling instead! 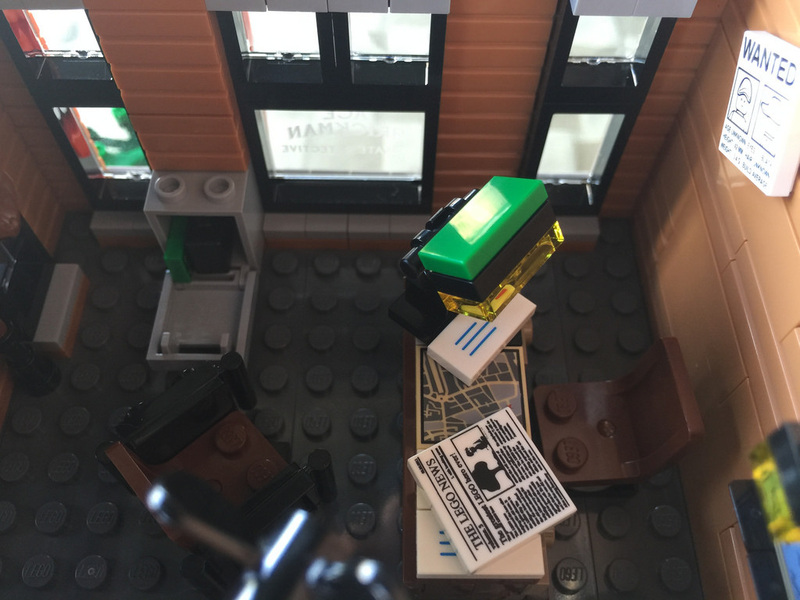 Our intrepid detective, Ace Brickman is on the case, but is clueless that it’s all going down in his very building. The kitchen is responsible for the cooking, with the fire escape being used as the conduit from the top floor, so it can be pushed through a grate at the back of the barber shop, under the central stairs, and into the pool hall. There’s also the separate polybag that was released with purchases online during December. I think the flower cart guy was smuggling the barrels out for wider distribution. Read more next week for the details on that set. The story is a great addition to the set, and just increases the playability of the set as a whole. 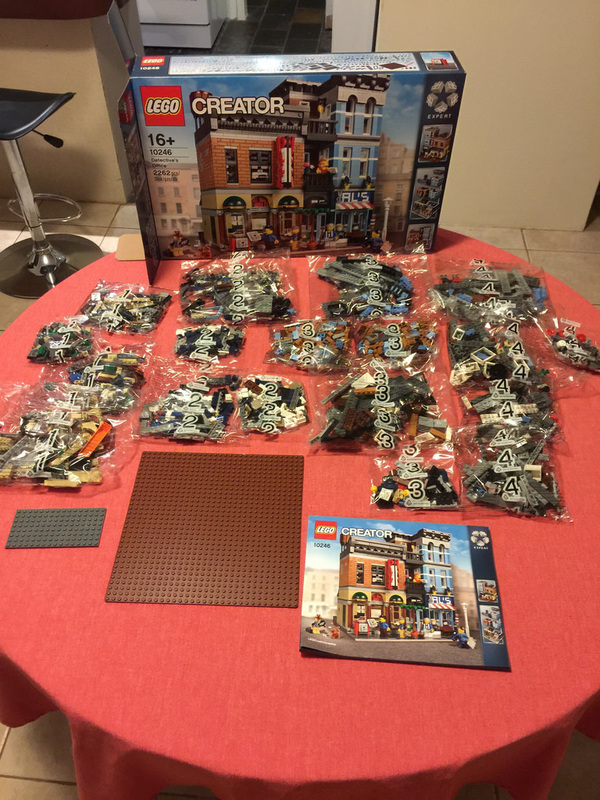 In the box you’ll find an instruction book, brown 32×32 baseplate, grey 8×16 plate, and 18 bags of parts. Let’s get stuck into the ground floor. First off, the pool hall. There are a few new parts in this room, being the pool room’s 1x4x6 printed windows (they both have “The Highlander” printed on them). There’s also a mini trophy, and 2 dark green 4×4 domes, used for above the windows. Two of the new pieces that are the most interesting, however, are both round 2×2 tiles. One has a dartboard print, and the other is a round plate with a knob in the middle. These have been used as table tops – one in the pool hall (seen in the bottom right of the picture above), and one in the kitchen. Other interesting parts include 4 full pairs of showshoes (used as fanblades), and a good selection of different doors and windows. Finally, we also get a 32×32 reddish brown baseplate. This is a first again, so get the set if you want to do some dirt style MOCs! 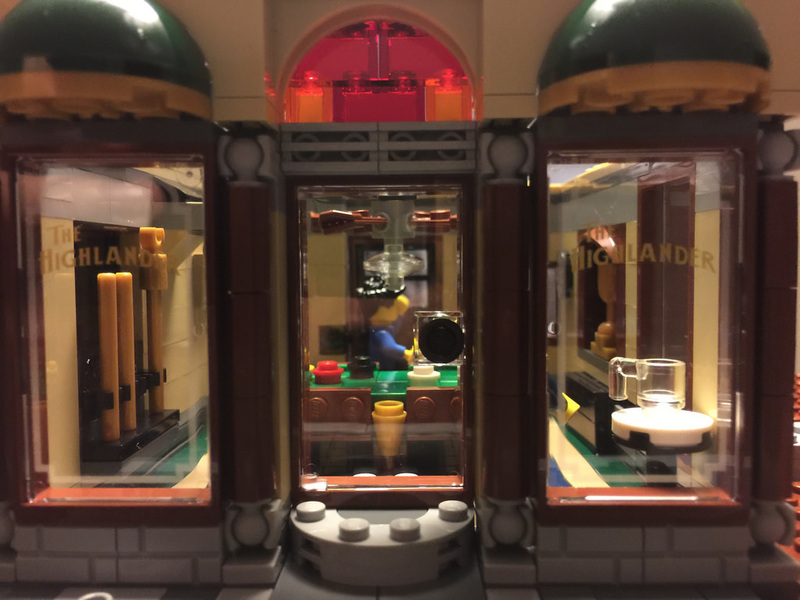 The minifigures in this room include a darts player and a pool player. I’ve honestly got a little bit of a problem with the darts. Obviously, they’re not darts, but Indian feathers. I guess they kind of work, but there isn’t enough of a grip for the minifigures. 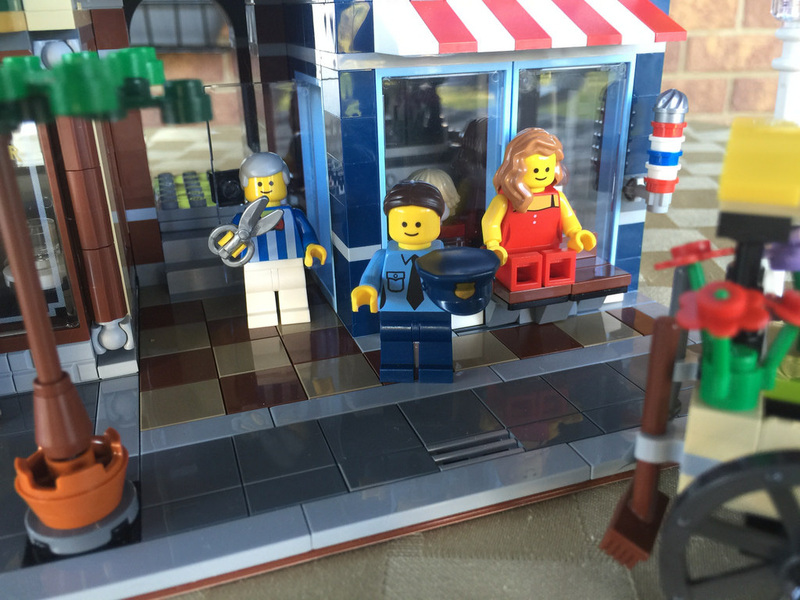 I never realised, and you probably wouldn’t if it was your first modular set, but all the minifigures that come with modulars have the classic face – 2 dots for eyes and a simple smile. Next door is the barber shop. From what I can tell, much of these parts are pretty standard, but there are 3 I’ll give special mention to. Firstly, there’s the scissors! These are proving to be very popular among fans, and you get 3! One for the barber, one as a spare, and one as a greeble on the sign. If you aren’t sure what greebles are, it’s basically the fine detailing on the outside of a set to make it look more complex and cool. The next part has got to be the mirror. Yep, you get a true reflection mirror. Admittedly, it’s not a block, so there’s no studs on it, but it does slide in quite well, and it fits perfectly within a 1x4x6 door frame. This is going to be very popular amongst fans. The last thing I want to give specific mention to in this set is the 1×1 decoration top. In the silver-metallic finish, it looks like it could be a great exhaust vent for a rooftop, but in this case, it’s as a topper for the swing-out cabinet in the barber shop, and the top of the barber’s pole out the front. Back over at the pool hall, it’s kind of cramped. I can’t imagine the pool player would get a decent shot off! The pool hall is the biggest room in the building. There’s the dart board, pool table, cue rack, coffee table, trophy shelf and ceiling fan in this room. 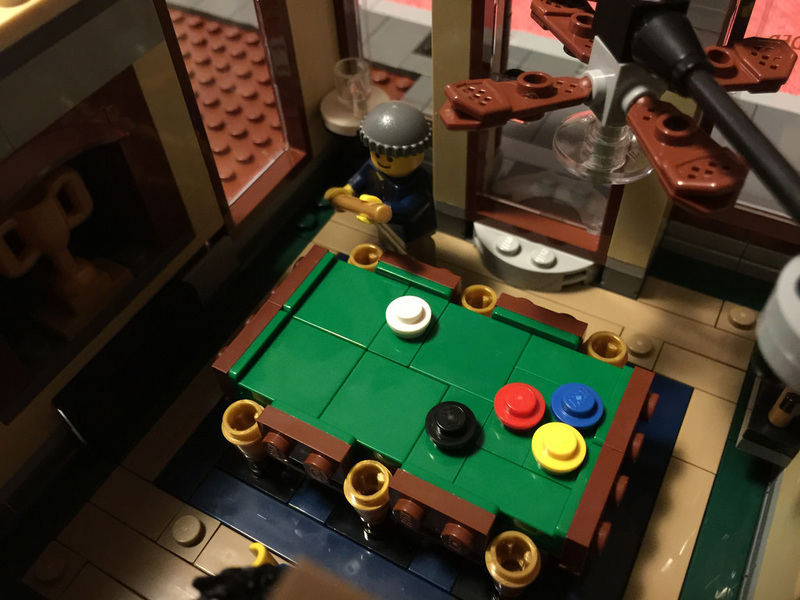 The pool table was an interesting build, as the cups are completely separate to the table itself. It looks great though, with the 1×1 plates as pool balls. With a little reconfiguration, you can set up the table to be as different as you like. The fan overhead looks great – it kinds of reminds me of an oriental fan. It can obviously spin, and can be swung left and right to get easy access to the room. I really like this room – it’s one of my favourites. There’s heaps of windows and doors, so it’s a very well lit room. The secret panel under the trophy cabinet is constructed really well. I never thought to do things like that! I won’t spoil it for you – you can find out yourself. There are also plenty of studs in the floor around the room, so there are loads of places to set up the characters. The touch with the stained glass above the door looks great, and with the domes above the windows, it looks like a few pubs I’ve seen in the UK before! There’s also a detachable section of sloped roof at the back of the room. Over at the barber shop, it’s even more cramped, as there’s a little outdoor walkway between the two rooms. There’s a staircase that can be moved out of the way, so you can access the other hidden hatches, but there is definitely less light coming through this room. 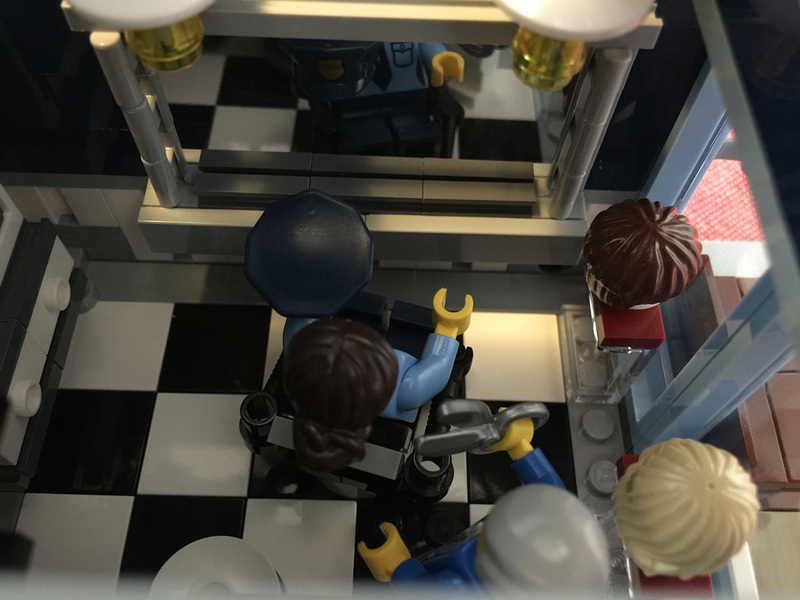 There’s some great detail put into this room, including the shampoo basin, mirror, wig stands at the front, and my favourite little part of this interior, the barber’s chair! However, the sign for the shop is really cleverly put together with sideways plates and tiles. They clip onto the bar at the back of the sign, and when it’s all put together, spells out AL’S. This was genius, and my favourite part of this build. Out the back, there’s the grate with some greenery on it, and a rubbish bin, that contains a red cap. I’ve got no idea what the deal is with the cap – maybe something to do with the smuggling operation? If any one has any ideas, let me know in the comments! Aside from that, the back of the build is very sparse. It’s just the bare brown baseplate. I thought they could have done much more with this, but it does leave more options for us! If I think of something to add, I’ll do it and take some photos. The only other part of the ground floor I wasn’t sure about was the top of the stairs. 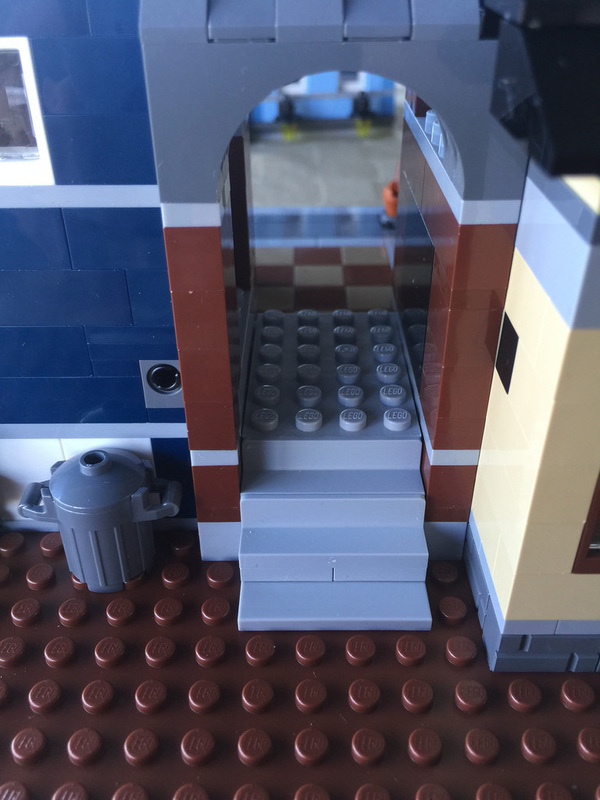 There are studs all over it, and while I realise that studs are an integral part of LEGO, it’s the only part of the ground floor exterior that is not tiled. I’m planning on replacing it with some tiled parts instead. Again, I’ll post some photos of any mods I’ve done. I have seen a few photos of some modifications others have done, including expanding the size of the set completely, so I’ll post that up later this week! There are some pretty great printed pieces in this section, specifically in the office half. Firstly, you get plenty of 1×2 and 1×4 profile bricks in medium nougat. These are great in any build, and there are loads! 64 1×2 and 21 1×4. 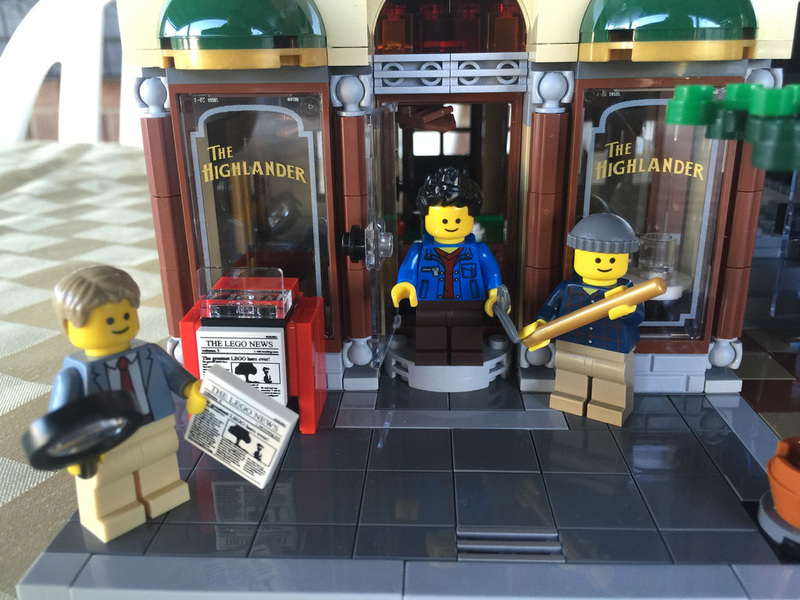 Of course, there’s the “Ace Brickman Private Detective” printed window, which looks great. The printed parts are the best in this room though, and there are plenty! Letters, newspapers, a wanted poster, painting, map and money are all in the one room. Even the door for the detective’s office is really nice to look at. 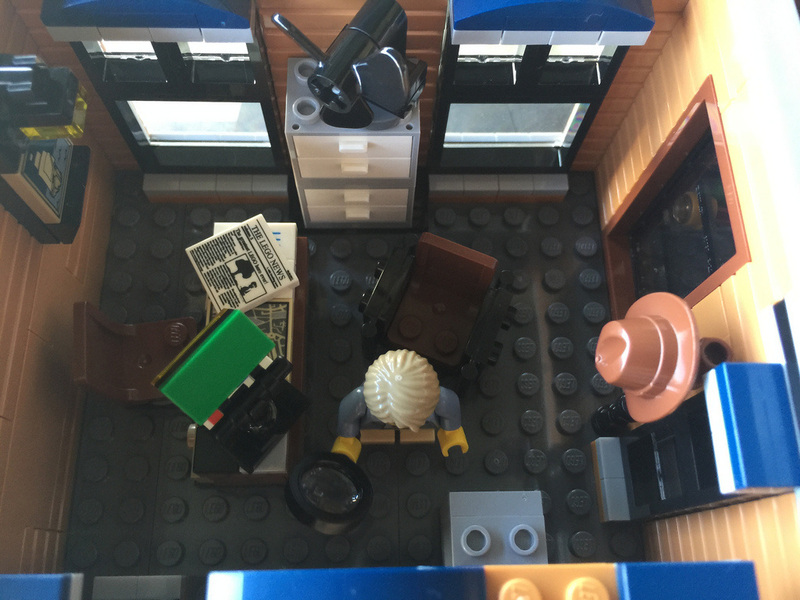 I really like the look of the detective’s desk. It’s cluttered, sure, but it looks classy. The desk lamp is way out of proportion, though. The hat stand is great, and I love the hidden letter behind the picture. I did encounter a little issue, however. Right outside the detective’s office door is the little planter bowl I mentioned before. The problem is that it’s too close to the door, so the door doesn’t open. Of course, it’s an easy fix, just move it. Needless to say though, it’s in the wrong spot. All in all, there’s much more space in this room, so it works much better. That’s it for this week. Stay tuned next week as I look into the rest of the building, check out 40140: Flower Cart, and give the whole set a review!